I love coming up with new ways to serve veggies, like this warm and creamy dish. 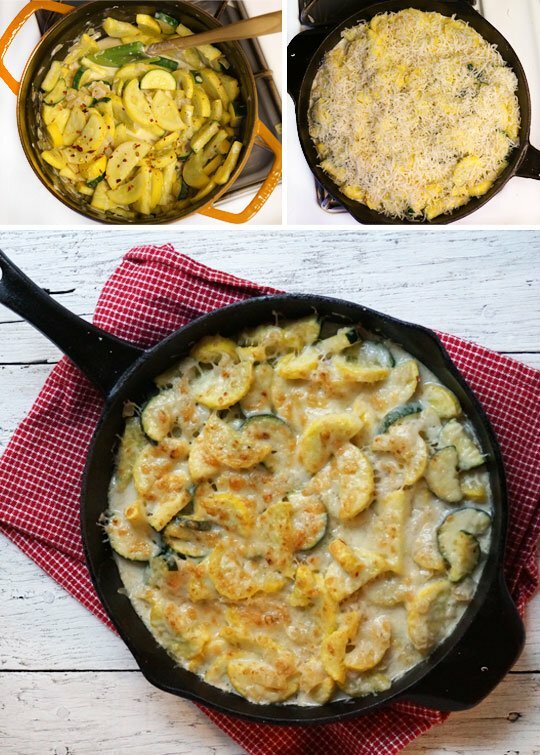 I wasn’t sure what to expect when I got started with this recipe; I just knew that I needed to use up the summer squash in my fridge ASAP. So, I sauteed it with some onion and garlic, added a bit of yogurt for creaminess, and topped it with a layer of bubbly cheese. The result is so tasty, I think it would make a nice holiday side dish– one that is pretty quick and easy to prepare. 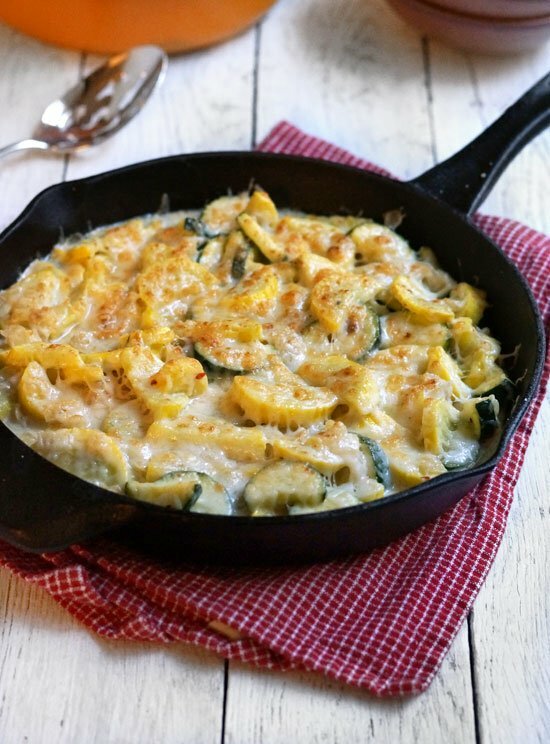 If you don’t have summer squash on hand, I have a feeling a variety of other vegetables would work with this recipe, too. Broccoli, green beans, or even cabbage would probably be delicious, so feel free to get creative! Melt the butter or coconut oil in a skillet over medium heat, and saute the onion for 5 minutes. Add the garlic and saute until fragrant, about 1 minute. Add the chopped squash into the pan, season with salt and red pepper flakes, and saute until the squash is as tender as you’d like it to be, about 10 to 15 minutes. Stir in the yogurt, then sprinkle a layer of shredded cheddar over the top. Set the oven’s broiler to high, then place the pan 6 inches under the heat source to broil until the cheese is bubbly, about 3 minutes. Use a slotted spoon to serve warm, and enjoy! 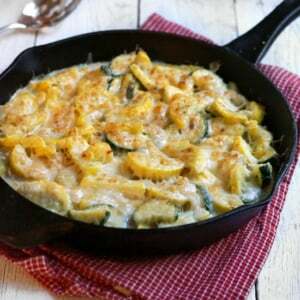 A quick and creamy way to serve your favorite summer squash. Melt the butter or coconut oil in a skillet over medium heat, and saute the onion for 5 minutes. Add the garlic and saute until fragrant, about 1 minute. Add the chopped squash into the pan, season with salt and red pepper flakes, and saute until the squash is as tender as you'd like it to be, about 10 to 15 minutes. Stir in the yogurt, then sprinkle a layer of shredded cheddar over the top. Set the oven's broiler to high, then place the pan 6 inches under the heat source to broil until the cheese is bubbly, about 3 minutes. Use a slotted spoon to serve warm, and enjoy! Depending on the location of your oven's broiler, you may need to alter the size of the pan you use. I originally started this dish in a 3.5 qt. Dutch oven, but it doesn't fit under my gas oven's broiler, so I switched to using a cast-iron skillet before broiling. Reader Feedback: What’s your favorite vegetable side dish? I found your website and do enjoy it. My question is why no nutritional info? I made this for my husband and 16month old daughter tonight and it was so delicious! I used regular goat cheese because I couldn’t find cheddar and it was still really good! I love almost all of your recipes. I try to stay as dairy free as possible so I make a mix in the vita mix of cashews, sunflower seeds, a little hemp milk and maybe a little Bragg amino or yeast to get creamy. When it cooks the nuts despite being very blended they toast on the bottom of the pan and it taste even better!!!! The sprinkle of cheese is an ok garnish. Oh my this looks so yummy! It’s so refreshing to see so few ingredients! This was a relly nice dish. At first I wasn’t sure about it when the greek yogurt curdled, but it ended up giving the dish a ricotta cheese texture which was fine for me. I also added in some sundried tomatos which for me stepped the dish up a few notches. Thank you for the recipe, tasty. Why is goat cheddar the most amazing thing ever?! Better yet is raw goat cheddar mmmmm! I am truly happy that I found your site. So many great things you have shared. I so look forward to trying this delicious looking dish. Yum, this looks so good!! Yum, this is right up my alley, because my favorite veggie side-dishes are ones that are quite healthy and simple but have a touch of flavor and richness – like your pizza creamed or roasted veggies, my spiced sauteed broccoli with cheese, etc. 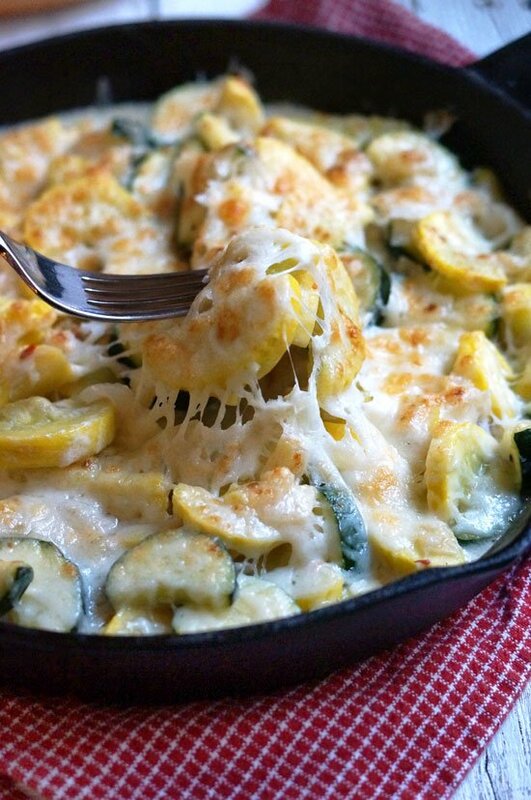 Veggies with cheese are a match made in heaven to me, & I love your addition of yogurt. Perfect timing! I just made this for dinner, and it was SO tasty! My 7yr old even loved it! I added cooked chicken to make it a more complete meal, and I also added chopped frozen spinach and some Italian seasoning. Yummy! Thanks for the broiler idea! yum this sounds great. Love the yogurt in this to help with creaminess without the fat. Love! Thanks for sharing.